Spot silver prices largely followed the gold market last week closing significantly lower ending with a wide spread down candle which breached all three short term moving averages but finishing well above the 200 week average which currently in the $14 per ounce price handle. 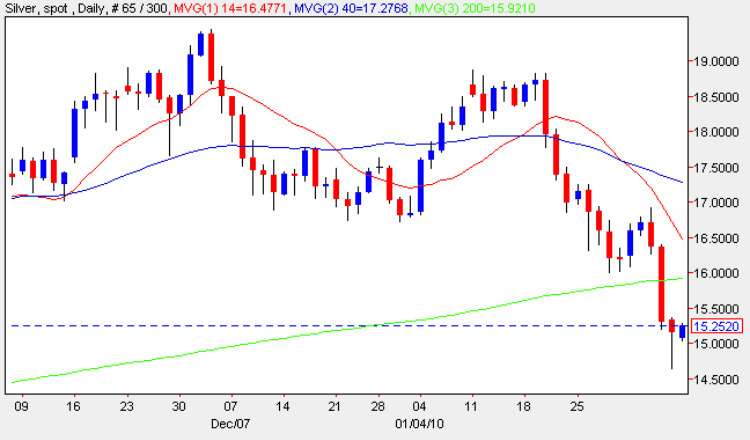 Whilst the daily chart for spot silver has many similarities to gold there are several key differences: first Thursday’s sharp move lower breached the 200 day moving average adding a further degree of bearish sentiment to an already established move. Second Thursday’s price action also breached key technical support in the $15.75 per ounce region which now presents a potentially strong area of resistance to any recovery. Finally the spot silver price now has considerable resistance to overcome in any short term recovery. Friday’s candle, on the other hand, provides us with a degree of optimism in the short term with a deep hammer candle which could provide us with some trading opportunities to the upside but only on an intra day basis given the bearish picture indicated by the moving averages. Any longer term recovery in spot silver will require sustained momentum to breach the established resistance now firmly in place between the $16 per ounce and $19 per ounce peak of mid November.